Hours of traveling will fly by as kids play tic-tac-toe, solve puzzles, and compete in a fun highway search game, all while learning more about God's Word. Travel Time Fun, a sturdy, reusable wipe-clean book for ages 6 and up is appropriate for use with any non-permanent marker. 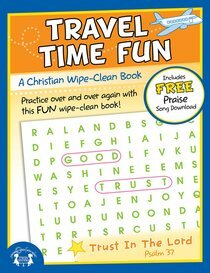 About "Wipe Clean Book: Travel Time Fun (Age 6+) (Use Themes)"